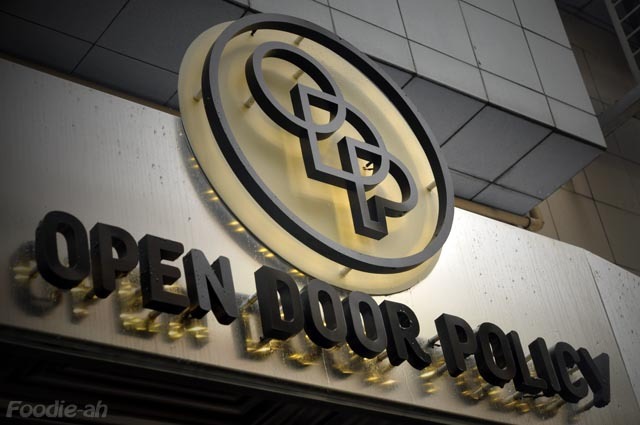 Open Door Policy is the latest happening place in Tiong Bahru. 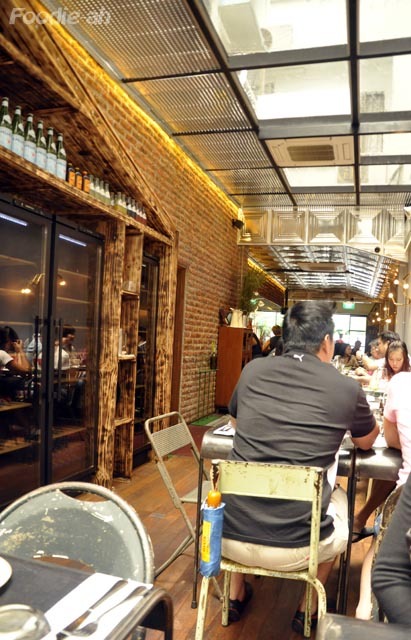 More specifically, Yong Siak Street is flourishing with quirky, dynamic and interesting new places such as 40 hands café, a fashionable bookstore and a furniture and art shop. There is a good reason why this is happening in this specific street, which roots down to its unique character. It is actually the 40 hands owner who has a share in this restaurant, where he guarantees that speciality coffees are served. The quirky setup certainly keeps diners entertained, with the kitchen bringing action into the narrow dining room, natural light filtering from the glass ceiling at the back, the rustic materials such as brick walls, steel and rusted chairs. Such exciting combinations make the place feel "real" and alive, for once away from the polished, aseptic setups that have been out of fashion abroad for quite some time and are also becoming dated on this island. Chef Ryan Clift from Tippling Club also has a stake in this restaurant as the food concept supervisor. 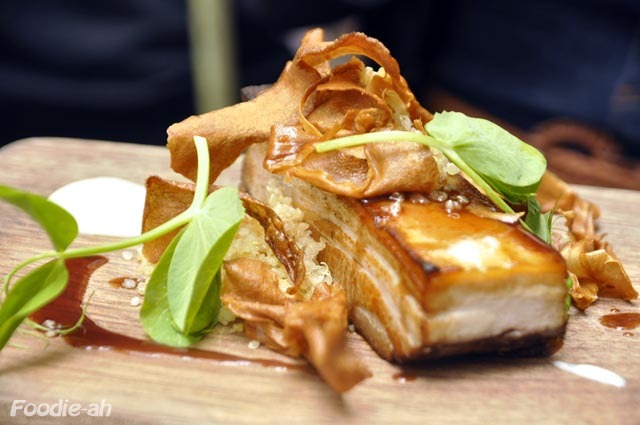 Unlike the Tippling Club which is more experimental, the menu here is very simple and earthy, the kind of food which you would enjoy for a Saturday or Sunday lunch. And it was in fact during a Saturday lunch that I visited the place and tried a couple of their dishes. 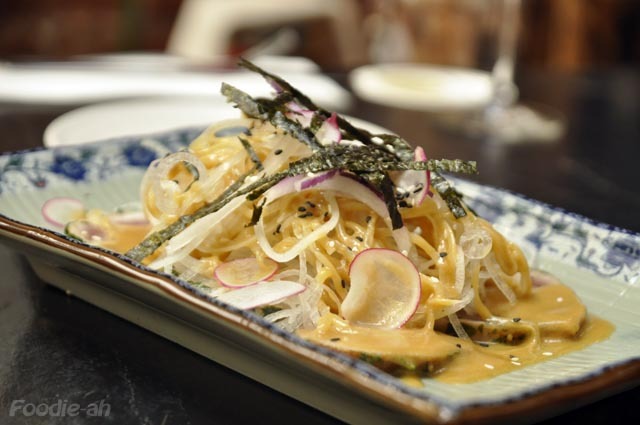 The Flamed tuna carpaccio with radish and yuzu salad (S$19) came topped with abundant "radish noodles" in a tangy yuzu sauce. The tuna medallions were lightly seasoned and seared all around them for flavour. I liked the fact that the slices of tuna were thick enough to appreciate the texture of the fish. The Grilled carrot salad with snow peas, orange walnuts and cardamom dressing (S$16) was a bit of a pleasant surprise. 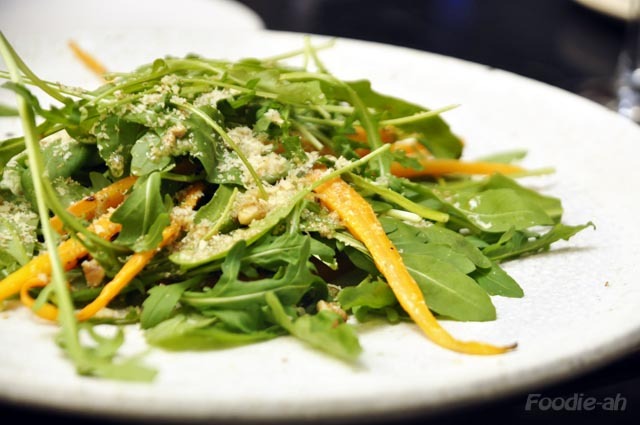 A bed of fresh rocket salad unveiled a warm carrot pureé, which also served as the sauce for the whole salad. Shreds of carrot and walnuts added a bit of crunch. This was really a bit of a welcome twist to what I would have expected from the description. Unfortunately, the Pork belly with parsnip puree, braised quinoa and celery (S$29) looked better than it tasted. I must say that the amount of meat was incredibly generous, in fact too generous perhaps, for a cut of meat which is so extremely sinful. In this case, less is more. The lack of sauce to complement the meat was where this dish fell short, as the parsnip puré was just not enough to help it come together. On the other hand, both the quinoa and parsnip chips were excellently done. I enjoyed the Roasted salmon with panzanella salad although the salmon was surprisingly quite raw (they claim it's 80% cooked, but it seemed more like 60%). This was perfectly fine with me, since I like my fish raw, but some customers might return it, if unaware at the time of ordering it. 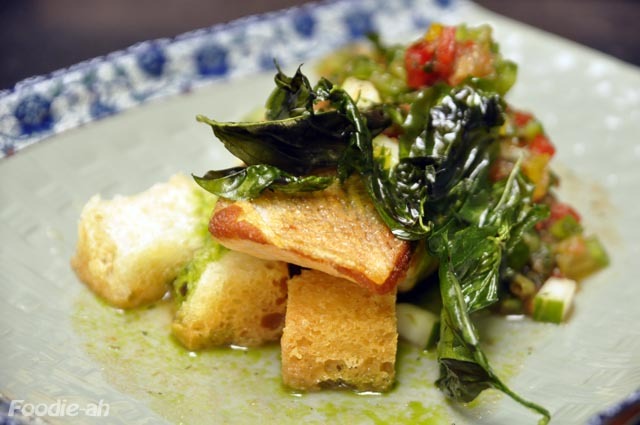 The panzanella dressing was a fantastic combination, and the crispy fried basil leaves were beautiful and aromatic. We were too full to try the desserts, or perhaps there was nothing on the menu that was tempting enough. I was intrigued by the fact that "Amaro Montenegro" was available in the list of spirits. It is my favourite "amaro", a very Italian drink virtually unknmown abroad. It goes to show that this place really tries to offer something different! 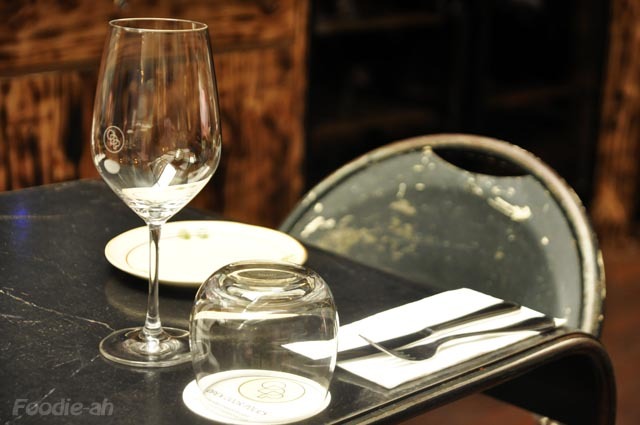 Overall, the place offered a good dining experience both in terms of setting and food. Don't expect anything out of the ordinary, but you will get some modern, earthy, no frills food at affordable prices in a cool setting in an up and coming district. I would go back try this again soon.